Chatting with Samantha Maloney, the drummer who discovered Cherri Bomb – Live! Starring ... You! 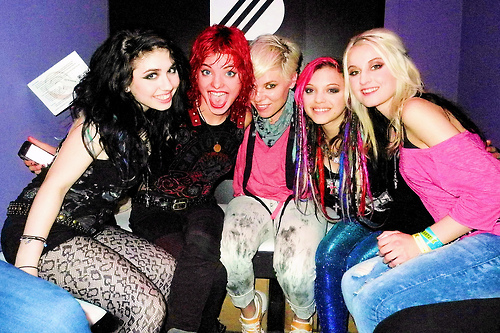 Rock drummer Samantha Maloney, center (in pink shirt), has become the manager of Cherri Bomb. From left: guitarist Julia Pierce, drummer Nia Lovelis, Maloney, bass player Rena Lovelis, and guitarist Miranda Miller. Photo courtesy of Hollywood Records. Samantha Maloney is a superstar rock drummer who’s now devoting her career to managing Cherri Bomb. After being asked to check out Cherri Bomb by one of the band members’ mothers, Samantha was so impressed that she ultimately signed on to manage the group of four teen girls (ages 14-16), helping them land a recording contract with Hollywood Records, opening gigs for bands like the Foo Fighters and Smashing Pumpkins, and a spot on the 2012 Vans Warped Tour, where LSY! interviewed them. LSY’s executive editor, Tim O’Shei, recently caught up with Samantha to find out why Cherri Bomb caught her attention, what she’s trying to teach the four girls, and what advice she has for any teen with big dreams. LSY: Why were you interested in working with Cherri Bomb? Samantha: I saw them and I had no expectation. At the time they were 10 and 11, and they basically blew me and all of my friends away. They do it for no other reason than they love it. That reminded me of me as a young teen. I picked up drumsticks because I loved playing. It wasn’t about wanting to be in a band or be a rock star. I felt like that’s why they were doing it. They loved playing music, they loved playing their instruments. I wanted to help them. LSY: When the Live! Starring … You! team interviewed Cherri Bomb on Warped Tour, I got the impression that fame is not their motivation. Samantha: No, and if it was, I wouldn’t be interested in working with them. If you want to be famous, don’t join a rock and roll band. Get yourself a reality TV show or something. If you want to be a musician, start playing with other people – that’s how you do it. But we are not in this business to be rich and famous. This isn’t the business to be in to do that. LSY: As their careers get bigger, what are the important lessons they have to keep in mind? Samantha: Making sure they’re the best musicians they can be and the best people they can be. I don’t care if you are the greatest musician in the world; if you don’t have people skills, no one is going to care about you. For myself and every band that meets them, we all treat these girls as people we can take under our wing. We try to teach them not only what to do but more importantly what not to do. To respect other musicians and people in general. It’s been about them becoming the best musicians they can be and learning that this life is not easy, but they are grateful for every moment they have. These kids work harder than anybody I know. They’re out of school – they’re making those sacrifices to be in this band. Although kids might feel like, “Boo hoo,” it’s a lot of pressure for them to be homeschooled and then be at rehearsal five, six days a week. The learning curve is them being disciplined enough: If you want to do this, it’s going to take a lot of time, heartache and pain. But the rewards will pay off. That’s what I always tell them. LSY: What are some of the potential pitfalls for young musicians that you want to make sure they avoid? Samantha: Besides being pompous a##holes, there’s also the thought that drugs can be a cool thing or drinking can be a cool thing. I mean, some of the bands I’ve played drums in, some of the people in those bands are poster children for what not to do, poster children for an anti-drug campaign. I can tell them my own personal stories of bands that I’ve worked with, or toured with, or who are friends of mine, who have lost it all to be on drugs on drinking. Or be the type of people who shoot themselves in the foot all the time because they think they’re too cool for school and their s### doesn’t stink. LSY: Although they’re young, in our interview with them they didn’t make a big deal out of their age — and they came across as older. If anyone says to them, “Do you want this Cheri Bomb t-shirt in pink?” they shy away from that because they don’t want to be known as being really good for being a band of girls. They just want to be really good. LSY: As far as their style and onstage show, how much have you helped them? Samantha: Honestly, those girls have really good style. Sometimes they joke around: When I’m cleaning out my closet I give them hand-me-downs, which they wind up calling “Sam-me-downs.” But really, the style is all them. As far as their presence onstage, it really is all them. I try to help them improve on their strengths and tell them what their weaknesses are so they can become better musicians and performers. Sometimes I jokingly say to them, “The crowd hears what they see.” So if they see a band that doesn’t feel what they’re doing, who seems bored, then the music sounds boring. If you’re having a bad day or something is not working right with your equipment, you’ve got to be a professional and not let the crowd see that. That’s part of the learning curve as well. LSY: Our Live! Starring … You! fans are roughly the same age as Miranda, Julia, Nia and Rena, and most of them dream of becoming professional performers. What’s your advice for them? Samantha: If you work hard and practice hard, keep on going, your dream will happen. Dreams do come true. As long as you put in the time and the practice you will accomplish all your goals. Aspiration, inspiration and preparation equal success. « PLL’s Lindsey Shaw: Does 8th grade coolness really matter?